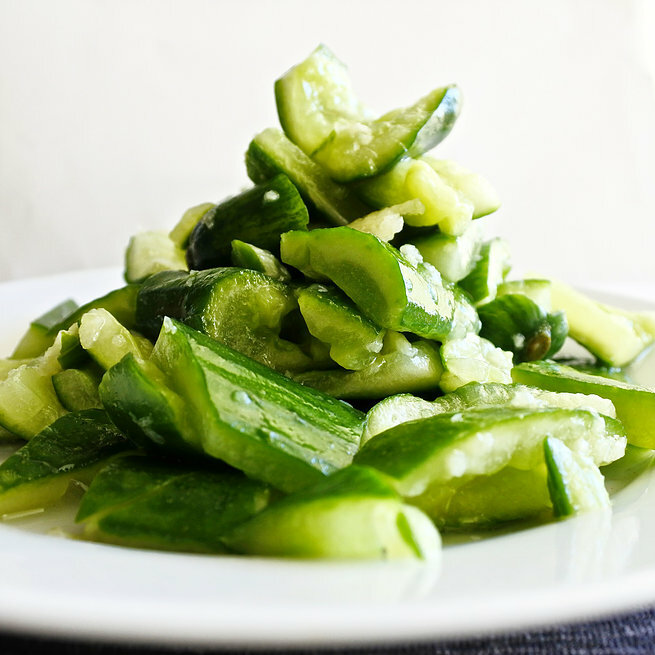 I fondly remember this Chinese cucumber side dish as being a big hit with kids. When so many times, I found myself battling with children to eat their vegetables, I never had a problem getting any of my students to finish their cucumber at lunchtime. AND honestly, why wouldn’t they like it? Crushed cucumber, seasoned with salt, a touch of sesame oil and black vinegar-I’d happily devour that. Serve either as a cool vegetable side dish for when the weather is hot or as a starter to dumplings. I guarantee you’ll be equally as fond. A traditional Chinese side dish of crushed cucumber with garlic, sesame oil and Chinese black vinegar. Serve with dumplings for a tasty meal. Wash and dry the cucumbers. Take a rolling pin and roll it over the cucumbers, smashing them in the process. Roughly chop then up with a knife into bite sized pieces then transfer to a bowl. Top with minced garlic, rice vinegar and sesame oil. Toss to combine and season with sea salt to taste.